Keeping your hard disk in good shape is not an easy task. Fortunately we can count on applications like FlexKit, a package of tools which have been specially designed to analyze, optimize and clean your hard drive in a few easy steps. 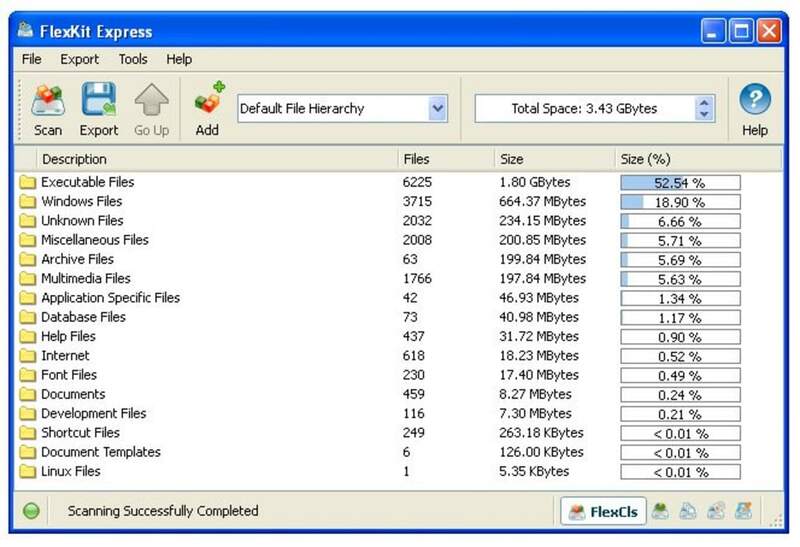 This kit consists of five different utilities: FlexCls, FlexSize, FlexDup, FlexHash and FlexSig, Each one of them is devoted to a particular task, namely file categorization, space arrangement analysis, duplicate file search, signature generation for files and integrity check for files and directories. All five tools share the same interface and are very easy to use: simply select the one you'd like to run in the window's bottom right corner. Three of them (FlexCls, FlexSize and FlexDup) will need to perform an analysis before showing any results. This analysis must be repeated three times for each one of them, and in the case of FlexDup, it takes quite a long time. On the upside, analysis results can be really helpful to optimize your disk structure, find out which directories are eating up too much disk space and free a bunch of megabytes by deleting useless duplicate files. Plus, they can be exported to a TXT, CSV or HTML report. A great collection of tools to improve your system's general performance. 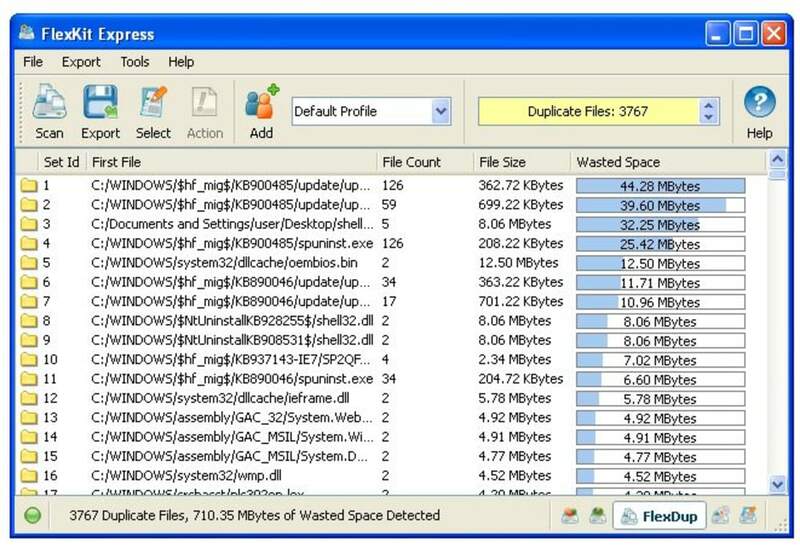 FlexKit is an integrated file management toolkit allowing one to classify and categorize files, analyze disk utilization patterns, identify storage consumption hot-spots, eliminate duplicate files and free-up storage space. FlexKit integrates numerous file management tools into a single package and allows one to perform all operations through a centralized and unified GUI interface. Designed for usability and flexibility at the same time, FlexKit is suitable for novice computer users and experienced professionals as well. FlexKit Express is a freeware version of the product that is perfectly fitted to be used in the home environment. FlexKit Express is completely free and may be used for any personal and commercial purposed. FlexKit Professional is a more powerful and flexible product version that is especially designed for professionals and power users. In addition to more powerful capabilities, FlexKit Professional provides command line utilities for all available file management tools. What do you think about FlexKit? Do you recommend it? Why?